This classic musical tells the fictionalized story of sharp-shooter Annie Oakley, and her days as a performer in Buffalo Bill’s Wild West Show. As she falls for Frank Butler, formerly the star shooter of the troupe, elements of the battle of the sexes come into play. The show, by Irving Berlin (music, lyrics) and Dorothy and Herbert Fields (book) is bursting with familiar tunes.This is a bright, funny musical about love and showbiz, and whether the two can coexist. Tickets to on sale Wednesday, March 15 at 11:00 AM. Season Subscribers may select their seats before tickets go on sale to the public. City Circle’s annual teen musical is Disney’s story of an adventurous undersea princess who longs to break free of her environment and explore new worlds. The show is based on the Disney film of the same name, which was based on Hans Christian Anderson’s classic tale. Alan Menken wrote the music, the lyrics are by Glenn Slater and Howard Ashman, and the book is by Doug Wright. Tickets go on sale Wednesday, May 3 at 11:00 AM. Season Subscribers may select their seats before tickets go on sale to the public. Tickets to the show are $12-$27 and can be purchased online at http://www.coralvillearts.org or by calling 319.248.9370 or in person at the CCPA box office at 1301 5th Street and at the Coralville Recreation Center at 1506 8th Street. After much deliberation, Director Elizabeth Tracey has released the cast list for our October production of August: Osage County. She is still searching for the right actor to play the role of Bill. If you are a male actor, who reads between 45 and 55 years of age, and you’d like to be considered for the role, please email her at liz@citycircle.org. Congratulations to the cast, and warm thanks to all who auditioned. The show will run Oct 21-23. Tickets for the new season will go on sale in July. We will have drinks and snacks and time to mingle in the lobby. and preview the upcoming season, We Can Do It! A Season of Powerful Women. Afterward, DJ Dr. Chris will spin some tunes, and everyone will be invited onto the stage for a dance party! Please let us know if you’re coming by sending a note to citycircle@coralville.org – you can also request a song for the dance party! It’s going to be great fun. We hope to see you there! Please note the change in performance dates: the show will run October 21-23. August: Osage County is a tragicomedy that offers fresh insight into the dysfunctional dynamics of the American family, set on the plains of modern day, middle-class Oklahoma. The Weston family members are all intelligent, sensitive creatures who have the uncanny ability of making each other absolutely miserable. “In August: Osage County can be heard echoes of other classic dramas about the strangling grip of blood ties — from Eugene O’Neill’s Long Day’s Journey Into Night to Sam Shepard’s Buried Child — but Mr. Letts infuses his dark drama with potent energies derived from two more populist forms of American entertainment. The play has the zip and zingy humor of classic television situation comedy and the absorbing narrative propulsion of a juicy soap opera, too.” Charles Isherwood, New York Times 2007. BEVERLY WESTON, 69 – The father and patriarch of the Weston family. VIOLET WESTON, 65 – Mother and matriarch. BARBARA FORDHAM, 46 – Bev and Violet’s eldest daughter. IVY WESTON, 44 – Bev and Violet’s middle daughter. KAREN WESTON, 40 – Bev and Violet’s youngest daughter. JEAN FORDHAM, 14 – Bill and Barbara’s 14-year-old daughter. STEVE HEIDEBRECHT, 50 – Karen’s fiancé, a Florida businessman. MATTIE FAE AIKEN, 57 – Violet’s sister. “LITTLE” CHARLES AIKEN, 37 – Mattie Fae and Charlie’s son. JOHNNA MONEVATA, 26 – Cheyenne Indian woman, housekeeper. SHERIFF DEON GILBEAU, 47 – High school classmate and former boyfriend of Barbara. It is preferred that those auditioning should read the play and be familiar with it beforehand. Scripts will be available at the Coralville Library for perusal. Please prepare a monologue of your own choosing or one from the script is welcome. Submit an Audition Form to secure an audition time. If you do not hear back within 24 hours please contact Liz Tracey directly at liz@citycircle.org. Walk-ups are always welcome and sides will be available for last minute auditioners. We were thrilled to see such a huge number of enormously talented teens at auditions for In The Heights! Sincere thanks to everyone who auditioned. If you were cast, we are looking forward to working with you starting April 30. Please pick up your script from Liz Tracey as soon as possible. If you haven’t heard from Liz, we may have an error in your email address. If that’s the case, please email Liz immediately at liztracey2015@gmail.com to arrange a pick-up time. If you weren’t cast in this show, don’t be discouraged. Keep working on your skills and keep auditioning! In The Heights will run June 17-19 at the Coralville Center for The Performing Arts. Tickets are on sale now at the Box Office (319) 248-9370, or online. PLANNING TO AUDITION FOR OUR TEEN SHOW? NEED HELP? FEEDBACK? GUIDANCE? A BOOST OF CONFIDENCE? Come to our Musical Theater Audition Workshop, hosted by Chris Okiishi. Saturday, April 2, 3:00-5:00pm at the Community of Christ Church in Coralville. This workshop is free and open to all current Junior and Senior High students at any Iowa school. Please email Chris directly at cokiishi@gmail.com to register. Include your name, age and contact information (email, cell phone, parent name and phone number) in your email. –basics of auditioning: what to expect on an audition day at City Circle and beyond. –principles of song choice: how to choose a cutting that works for you. –performance tips: being your best in the room and working with accompanists, audition monitors, directors, and other evaluators to show your range of talent. –individual instruction: as a group, we will listen to several members of the class perform their audition songs. In a supportive way, we will provide feedback and specific ways to improve. If you wish to perform your song at the workshop, please bring two copies of your sheet music. We will make every effort to hear as many audition songs as possible, but there may not be time to hear from all students. Students are NOT required to bring an audition song to participate in the class. This year’s Teen Musical will be the Tony-winning Best Musical In The Heights, with music and lyrics by Lin-Manual Miranda and book by Quiara Alegria Hudes. This show takes place in the predominantly Latino New York neighborhood of Washington Heights. The show’s composer encourages students of all identities and ethnic backgrounds to perform in this musical. It’s a chance for all of us to learn more about our world, our friends, and ourselves. We welcome teen performers of all identities and ethnic backgrounds to audition for all roles. Auditions are open to all Iowa teens who are currently in 7th-12th grades, and will take place on Saturday, April 9th and Sunday, April 10th from 2:00-6:00pm at Nolte Academy, 1619 2nd Street, Coralville. Callbacks will be on Monday, April 11, 8:30-10:00pm. Please come prepared with 32 bars of a song that showcases your talent and personality. We don’t want you to stretch at auditions – we want to see who you are! Bring sheet music in the correct key – an accompanist will be provided. Your audition will consist of a five-minute individual audition, and a group dance audition. If your audition appointment is between 2:00 and 3:30, you’ll be expected to stay [or return] for the 3:30 dance call, which will be done by 4:00. If you are scheduled after 4:00, you’ll be expected at the 5:30 dance call, which will finish by 6:00. REHEARSAL SCHEDULE – note that this schedule is a major departure from schedules past. It is imperative that you come to auditions with a COMPLETE list of conflicts, so take the time to peruse the schedule and write down every conflict you have (unless it’s something you’d be willing to give up to attend rehearsal instead). If you are cast, you may not miss rehearsals for conflicts that you didn’t list beforehand. Rehearsals for In The Heights will begin April 30, and run Saturdays from 4:00-10:00pm and Sundays 1:00-9:00pm for four weekends (Apr 30/May 1, May 7/8, May 14/15, May 21/22). We are tentatively planning to take Memorial Day weekend (May 28-30) off. On Tuesday, May 31, weekday rehearsals begin, and will run from 9:00am-4:00pm through June 10. On June 11, Tech Week begins. Tech rehearsals will run 6:00-11:00pm all week (Jun 11-16), with daytime rehearsals added as needed. The show runs June 17-19. Additionally, the cast will perform at Iowa City ArtsFest during the weekend of June 3-4, exact date and time TBA. When considering conflicts, please check your calendars for band and choir concerts, awards ceremonies, proms, exams, graduation/grad parties, family commitments, doctor/dentist appointments, and anything else that might conflict with the rehearsal schedule. NEED HELP WITH YOUR AUDITION? ADVICE? GUIDANCE? Come to our fun, FREE Musical Theater Audition Workshop on Saturday, April 2. We at City Circle are thrilled to announce that this year’s Teen Musical is going to be the Tony-winning Best Musical In The Heights! The show was strongly influenced by creator Lin-Manuel Miranda’s own experie nce growing up in an immigrant family in New York City. It tells several stories of people living in the predominantly Latino community of Washington Heights, a section of Manhattan, as they deal with economic stress, cultural changes, first generation college education, and gentrification. It has been performed all over the world and in hundreds of high schools across the nation. Its success paved the way for Miranda to write and produce the current Broadway sensation Hamilton with essentially the same team that created In the Heights. We wish to do just that: honor this time in our students’ lives to step into the experiences and roles of people of different backgrounds and cultures. At the same time, we know that we also serve an area with a vibrant and involved Latino community and want to expand our efforts to involve local students of all backgrounds in our program. We had originally planned to produce the classic Kiss Me, Kate this summer but Miranda’s comments have inspired us to bring the sights, sounds and stories of Washington Heights to Coralville immediately. In The Heights will be directed by Ian Zahren. Tickets are on sale now for the performances, June 17, 18 and 19. Auditions for In The Heights will take place April 9 and 10 and callbacks will take place on April 11. For more information about auditions, go to the Auditions page. We will be hosting an Auditions Workshop on April 2, for those who are auditioning for the first time, or who would like to get feedback and guidance before they audition. The details are here. 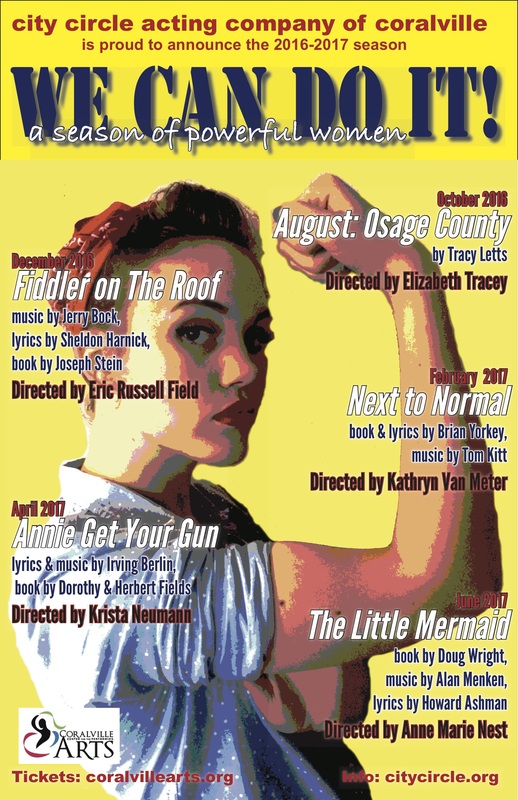 We Can Do It: A Season of Powerful Women is the theme of City Circle Acting Company’s 2016-17 season. 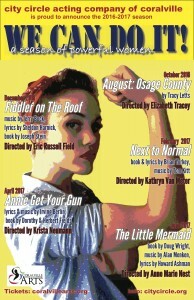 The season includes August: Osage County, Fiddler on the Roof, Next to Normal, Annie Get Your Gun, and The Little Mermaid. 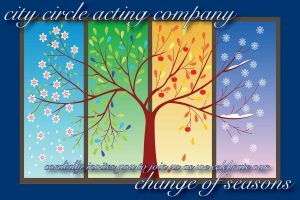 City Circle Acting Company is Coralville’s community theatre and the resident theatre company of the Coralville Center for the Performing Arts. The Center is located at 1301 5th Street in Coralville. Season subscription packages will be available beginning July 1 through the CCPA box office at 319.248.9370 or at www.coralvillearts.org; single tickets will go on sale at a later date. August: Osage County. October 21-23, 2016. Tracy Letts’ award-winning dark comedy is the tale of the ultimate dysfunctional family: Dad is missing, Mom is addicted to pills, and at least two of their three daughters are harboring secrets as everyone gathers in the Oklahoma house they grew up in. Just when you think things can’t get any stranger, they do. Originally developed and produced at Chicago’s Steppenwolf Theatre, this play won the Tony for Best Play, and the Pulitzer Prize for Drama. Fiddler on The Roof. December 9-11, 16-18, 2016. This classic musical by Jerry Bock (music), Sheldon Harnick (lyrics) and Joseph Stein (book) tells the story of Tevye, a Jewish dairyman in Imperial Russia at the beginning of the 20th century, who struggles to hold on to his religious and cultural traditions despite pressure to change. Perhaps the most powerful pull is that of his independent-minded daughters, who wish to choose their husbands, instead of abiding by the tradition of the matchmaker. Funny, sweet, beautiful and heartbreaking, this is a show for everyone! Annie Get Your Gun. April 28-30, May 5-7, 2017. This classic musical tells the fictionalized story of sharp-shooter Annie Oakley, and her days as a performer in Buffalo Bill’s Wild West Show. As she falls for Frank Butler, formerly the star shooter of the troupe, elements of the battle of the sexes come into play. The show, by Irving Berlin (music, lyrics) and Dorothy and Herbert Fields (book) is bursting with familiar tunes.This is a bright, funny musical about love and showbiz, and whether the two can coexist. The Little Mermaid. June 16-18, 2017. City Circle’s annual teen musical is Disney’s story of an adventurous undersea princess who longs to break free of her environment and explore new worlds. The show is based on the Disney film of the same name, which was based on Hans Christian Anderson’s classic tale. Alan Menken wrote the music, the lyrics are by Glenn Slater and Howard Ashman, and the book is by Doug Wright.